A rule based solution that fires in real time when a record has been updated or created and meets your criteria. It works with Accounts, Contact and Lead records. If you are looking to work with other objects then please check out our import wizard. 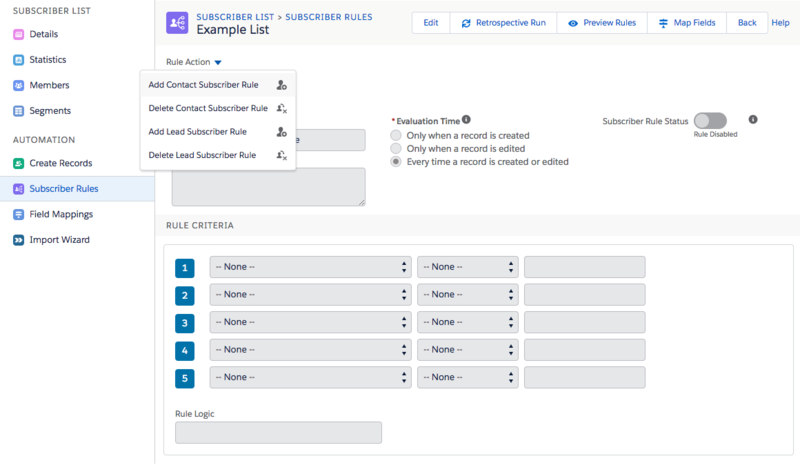 Subscriber rules are specific to a Subscriber List. You can have different rules for different lists. A Subscriber List can have a maximum of 4 rules, one of each type i.e. Rules instantly trigger and typically complete in a few minutes. Subscriber rules are not retrospective so if a record meets the criteria before the rule was created it will not trigger until the record is edited again or you start a retrospective run. 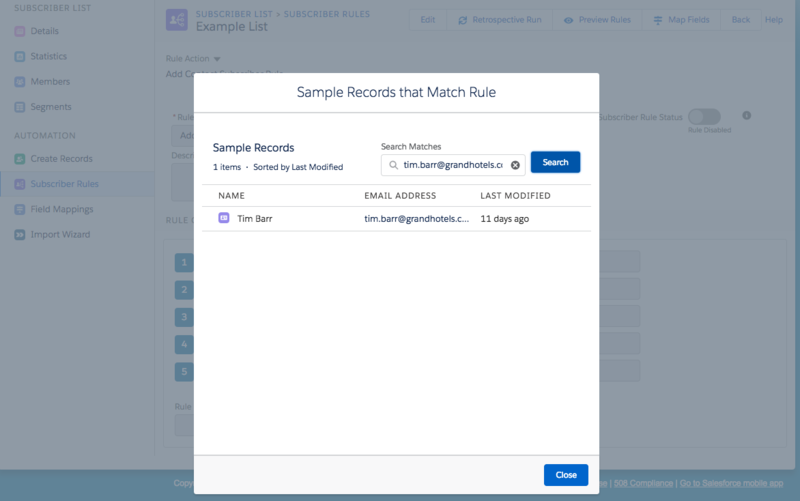 Salesforce users will need our standard permission set if they are updating records to trigger the rules to fire correctly. Once you have selected the rule you want to work with click the edit button. If you are working with an add rule you can choose the Evaluation time. Rule Criteria you don’t have to specify any criteria. This would mean any record that was created or edited would trigger the rule. You can add criteria to restrict which records cause the rule to fire i.e. adding criteria for a record that was created today would only cause the rule to fire for a record that met that criteria. You can only have 5 rule criteria filters, it is not possible to have more. A workaround would be to add a custom formula field so that you can add more filters and evaluate on that. A simpler option would be to use our import wizard which allows you to build a Salesforce report or list view with more complex filters find out more here. To help establish if your rule would bring back the correct records you can click the Preview Rules button. 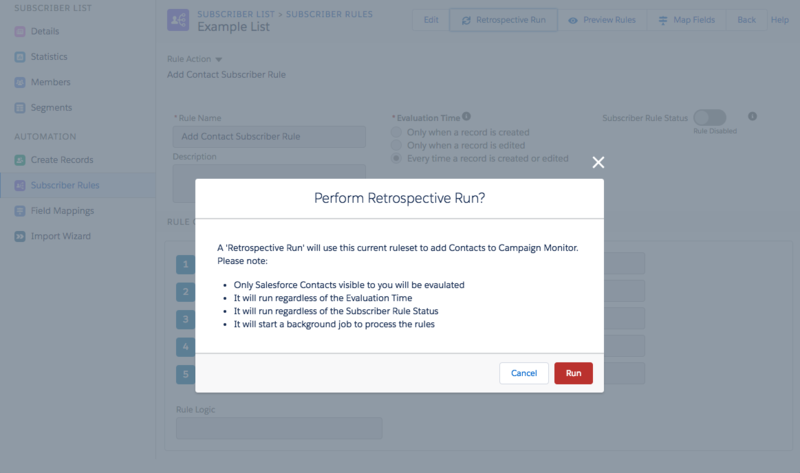 This queries Salesforce based on your rule criteria and brings back example records. Within the sample, you can search to find a specific record. If you have just created or changed a rule and want to make sure existing records that currently meet the criteria update Campaign Monitor you can run this option. This will trigger a process to run the rule against all contact or lead records depending on which rule you are viewing. In addition to contacts and leads, if you want Account changes to also trigger automatic subscriptions. To this go to our general settings tab in Salesforce and select the sync settings option. Under Advanced Settings enable Enable Salesforce Account trigger for Campaign Monitor actions. It is possible for your rule to be correct but not fire when a record meets the criteria. Below is a list of tips and tricks that might help. If you can find an example record which has not triggered a rule but should have try editing it and saving with no changes, This should trigger the rule to fire. If this does not work try going back to the subscriber rule and previewing them to see if you example record is included. There is a search within the preview to help you find your example record. If the record is there than you can trigger a retrospective run. If it is now check your rule is correct. When a record is added to a subscriber list via subscriber rules we will check to make sure the email address is not duplicated, it is valid, not on a suppression list. If a record was previously on a subscriber list and has been subsequently deleted or unsubscribed we will not subscribe them via an add rule. If the Salesforce user that has created or edited a record, which should cause the rule to fire, does not have our standard permission set then the trigger will not work. It worth checking your users have our standard permission set, this article shows how. In the same way if you have a Salesforce Site user creating or editing records that should trigger the rule it is likely the problem is also down to permission sets. Click here to learn how to assign the set to a site user. If you are having problems and the above issues are a factor the import wizard can be an alternative to subscriber rules or act as a safety net. It can be scheduled to run every hour of every day so will therefore retry if Campaign Monitor is not responsive. The import wizard run as a batch job so is far less likely to conflict with other code or processes in your Salesforce Org. It runs as the user that set it up so permissions should be a non-issue.